If you've ever had a spa facial, chances are one of your favorite parts of the experience is the facial steam. An herbal steam facial is an ultra relaxing way to boost skin hydration, improve circulation, deep clean pores and give skin a healthy, refreshed glow. In a few easy steps, you can make this a regular at home practice, and with the addition of some herbs and essential oils, you may find you like it even more. There are a number of benefits to herbal facial steaming. 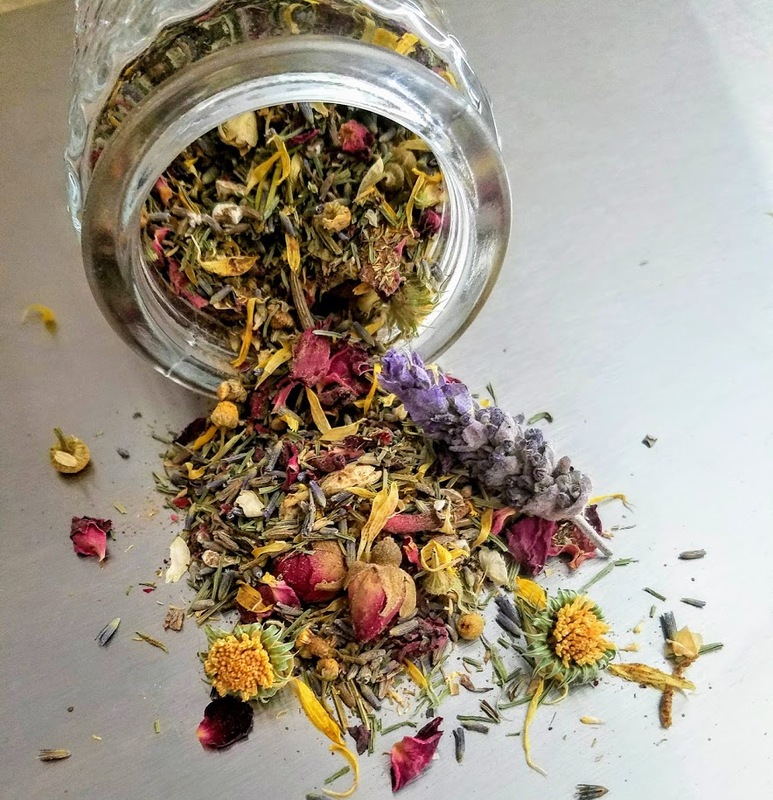 Just like an enjoyable cup of herbal tea can make your body feel nurtured, nourished, calm or uplifted, an herbal steam can offer the same benefits to your skin. As the steam rises, it opens the pores allowing the aromatic compounds in the herbs and oils to be absorbed into the skin. With a variety of beneficial botanicals available, you can choose the ingredients that you are drawn to and make it a customized at home spa experience. It's cleansing. Steam softens the skin and opens blackheads and clogged pores allowing impurities to be drawn out and gently released from the skin. It's hydrating. The water vapor is absorbed into the softened surface of the skin, allowing for the aromatic herbs to deliver all their beneficial properties into the skin. Skin becomes more supple and skincare product penetration will be enhanced. It improves blood flow. Steam increases perspiration, dilating blood vessels and improving oxygenation of the skin tissue. Your cheeks will be rosy & your complexion will glow as the enhanced circulation revives the skin. It feels amazing. The whole experience is invigorating and calming at the same time. The aromatic herbs and essential oils (if added) can clear the sinuses, calm the mind, and have a relaxing and uplifting effect in a very short period of time. With benefits that are instantaneously visible and so easy to achieve, especially in the comfort of your own home, it is worth putting together a mixture of your favorite herbs to try this out. Blend a few of your favorite herbs (see recipe below) and store in jar. Not sure what to blend and want us to do it for you? Contact us, and we will be happy to customize your facial steam. Some great herbs for skin include lavender, rose, calendula, comfrey leaf, chamomile, horsetail, rosemary, sage, peppermint, gotu kola, witch hazel bark, or burdock, to name a few. My recipe is below if you'd like to try it out. Cleanse your face to remove any makeup or debris and pull your hair back so it is out of the way during your facial. Set up a large, heat resistant glass or stainless steel bowl (It should be larger than your face. You will be putting your hot water in this bowl). For this you will chooses a counter top or table at a comfortable height so that you can sit or stand for the duration of your facial. You will need to put the bowl on top of a towel which will protect your counter/table from the heated water while insulating the bowl of steamy herbal goodness so it stays hot. You will also need a towel to put over your head during your facial to trap the steam. Bring 4 cups of distilled water to a boil (tap water is not ideal because of the chlorine and other particulate). As the water is heating, measure a good sized handful of blended herbs and put into your bowl (at least 1/4 cup, but you can certainly use more if you desire). When water has reached a boil, pour over herbs in bowl. If you are using essential oils, add 2-4 drops to your herbal steam now. Sit or stand over your herbal steam and drape your large towel over your head, creating a tent that captures the steam. Hold your face 8 inches above the water. Regulate the heat / intensity of the steam by lowering your face towards the bowl for more heat or moving away from the bowl for less heat. Do not allow your skin to touch the water, remember it's very hot! If you get too hot, just lift a corner of your towel to let in some cool air. Relax and enjoy for up to 10 minutes. When you are finished, pat your face dry and apply your favorite moisturizer or skin serum, gently massaging in an upwards motion. Aren't you glowing! See, I told you it would be worth it! A facial steam is an inexpensive and luxuriously simple at home spa treatment that offers visible results without requiring a lot of time. Making herbal steaming a part of your regular self care ritual is a great way to give your complexion a clear, healthy & hydrated glow. This recipe will make enough for approximately 4 facial steams. Directions: Combine herbs in a mixing bowl and stir with a wooden spoon. You may add a few drops of essential oils to the dry herbs now or wait until you do the steam. Store finished mixture in a sealed container. 5 drops Rose oil, 5 drops Jasmine oil, 3 drops Neroli oil and 3 drops Lavender oil. 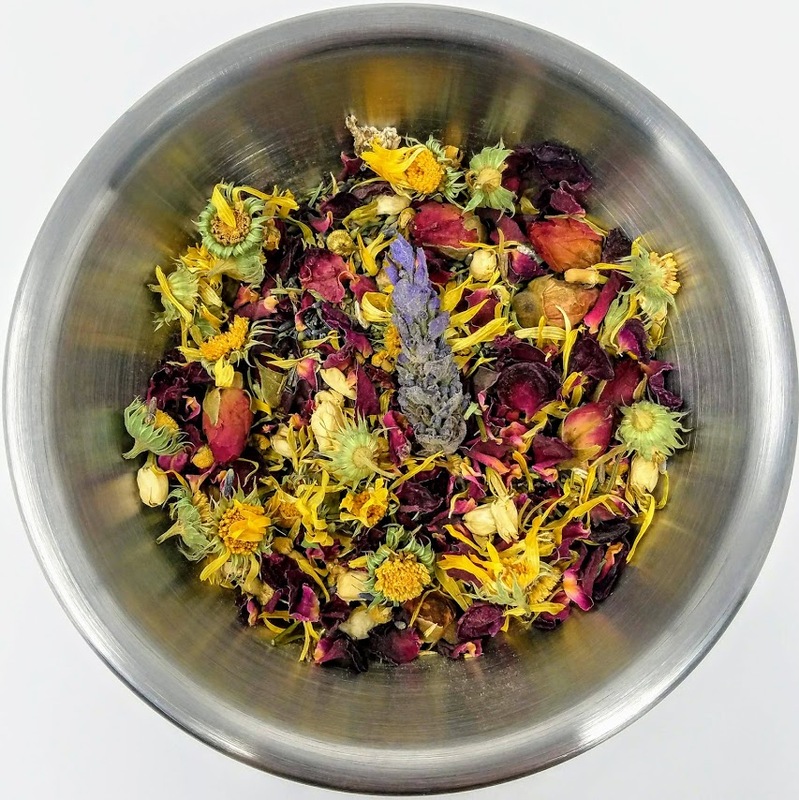 I wanted to create a luxuriously floral blend for my facial steam, but you can use whatever oils you choose.